Discover the "City of the Three cultures" since Christians, Muslims and Jews lived together. Toledo is a beautiful city-museum declared World Heritage Site by UNESCO. It is one of the oldest towns in Europe and has a great artistic beauty and buildings. Visit also with this tour the city of Segovia, famous for its Roman aqueduct, perfectly preserved, and for the architectural beauty of its most outstanding buildings; The Cathedral and the Alcazar. Once in Toledo, you will arrange your day as you like. 1 hour guided walking tour in Toledo is included. Return to Madrid from Toledo at 12:30 pm, the meeting point in Toledo for returning will be in front of the Restaurant Hacienda del Cardenal (Pº de Recaredo 24), close to Puerta de Bisagra. We will make a panoramic bus tour and stop at Mirador del Valle for taking pictures. We will return to Madrid for lunch (lunch not included). 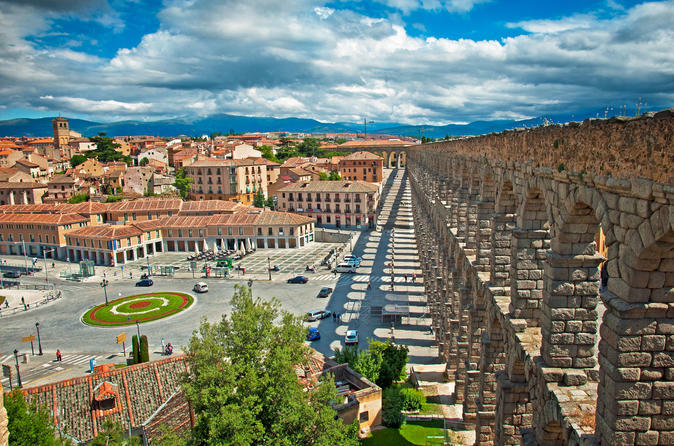 In the afternoon we will depart to Segovia, famous for its well-preserved roman aqueduct, which is 16 km long. Home of some of the kings of Castile, this city preserves one of the most important medieval group of buildings in Spain. Due to its elegance, the Cathedral of Segovia is considered to be “the Lady of the Cathedrals”, and the Alcázar is the most spectacular castle in the country. We will see the Aqueduct, and 1 hour guided walking tour will be provided in Segovia, free time to enjoy Segovia, shopping and pictures. Return to Madrid from Segovia at 6:30 pm, the meeting point in for returning will be Segovia Public Bus Station, located at Plaza de la Estación de Autobuses, 1.